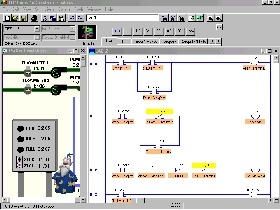 Ladder Logic Programming and PLC Simulation made Affordable. LogixPro is the ideal tool for learning the fundamentals of RSLogix ladder logic programming. The look, feel and operation of our ladder rung editor so closely mimics Allen Bradley's latest software offering, that many need a second look to be sure who's editor they're using. Of course the give-away is the window containing one of our ProSim-II Simulations. This is where LogixPro really out-shines typical PLC training setups employing a PLC connected to a handful of switches and lights. By graphically simulating process equipment such as conveyors etc. in software, the synchronous and interactive nature of real industrial processes, presents the student with a far more realistic and challenging programming experience. 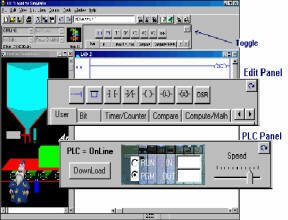 Couple this with our PLCTrainer and you have the perfect PLC training program. LogixPro PLC Simulator is now available on copy-protected CD. The CD/Key Edition brings complete portability to LogixPro, and is ideal for those wishing to utilize LogixPro on multiple computers. Whether at home, office, or school, LogixPro can now be ready for use. Just insert the CD, and any computer having LogixPro installed will detect the SafeDisc Key, and allow the fully unrestricted use of LogixPro. The CD contains the full LogixPro installation program. When inserted into the drive of a computer that does not yet have LogixPro installed, it will prompt the user to do so. Thereafter, the CD acts as the "Key", and LogixPro will start-up fully unlocked and remain so while the CD is present. In addition, there will be no need to purchase new CDs when LogixPro is updated or features are added . All future updates may be downloaded and installed at will, and without concern for the continued and unrestricted operation of LogixPro.